July 11, 1991, a mere 100 yards from The Center Line, on a cruise ship off the coast of Mexico, I viewed the longest total eclipse of the sun for the next one hundred and forty-seven years: six minutes and fifty-three seconds. Borrowed without permission from Mr.Eclipse.com. Photo by Fred Espenak. Click here. Standing on the rear deck of the Norwegian cruise ship, Southward, in the Pacific Ocean off the coast of Mexico, I stare through protective glasses for twenty seconds at a tiny bite eaten out of the right side of the sun. Three sunspots are visible in the lower hemisphere; two in the upper. Although it is hot beneath the sub-tropical sun, I wear a long-sleeved cotton shirt, broad-brimmed hat, long pants, socks, and sunblock 30 for protection. "You are up there, you ol' Moon. We can't see you, but there you are in the noonday sky." Small and close to the horizon, two cruise ships close the gap between us. White and romantic, we race to stay within the circle of blue surrounded by thunderheads as our captains strive for the Center Line. My brother, Brian, places the homemade square of styrofoam with silver film over a hole in its center over his longest telephoto camera lens. We take turns looking at a magnified image of the sun in partial eclipse. A man with a very large telescope with silver film over the end lets us look at the sunspots -- areas of relatively low temperature. The light grows dimmer, like sunlight shining through smoke thrown high into the atmosphere from a distant forest fire, but not yellowish. The air temperature sinks to pleasantly cool. "It's getting dimmer! It's getting cooler!" As midday approaches, Brian and I think we see shadow bands -- rapidly-moving, wavy shadows -- however, away from the heated air from the smokestack, they disappear. "Look at this." The shadow of Brian's finger on the deck is defined with sharp edges. He turns his finger ninety degrees and the shadow becomes fuzzy along one edge. Through protective glasses, only a sliver remains of the sun. Amazingly, though the light is much-dimmed, it is definitely daylight: a strange, dim daylight; not dawn; not twilight... unique; the strange, odd, disorienting period just before totality. What a different planet this would be if the sun shone so dimly all the time! What would grow? Would ice ages return? In ancient times, some peoples went insane during total solar eclipses. During an ancient battle, when the sun reached totality, the combatants stopped fighting and stared up in wonder. When it was over, all remained quiet. The desire for combat gone, their armies dispersed. In the last moments, the last minute, the last seconds before totality, I experience the madness. The racing shadow is coming! I must see it. I overturn deck chairs, desparately trying to reach the railing. My camera swings wildly from my neck, colliding against an upturned chair. Extra clothes and magazines scatter. The deck chairs stick fast. I race from side to side, tugging, pushing, glancing frantically out to sea, panicked by the wall of thunderheads, already dark. Night is upon them. I search the surface of the water for the racing darkness. Where is it? The sea is dark gray-green. I have become a primitive being, shouting, "Do you see the shadow? Do you see it?!" And then it is night. I have missed the shadow. In the narrow space between two upended lounge chairs, I look up. "Look up. Look up. Look up." There it is. Peace fills me. Joy. Wonder. Awe. Tears fill my eyes. There in the heavens is the most beautiful sight I have ever beheld -- impossible to describe. I never dreamed... The corona streams out around a perfect black disk ringed with light; the sky not black like night, but like a blue jewel. I am looking into the eye of God. I am not on this planet. I am somewhere far away in another solar system on a different Earth; humbled. Carefully, still looking up, I return the lounge chairs to their correct positions. Not taking my eyes from the beauty above, I lie down upon one of them, looking up. "I see the prominences!" 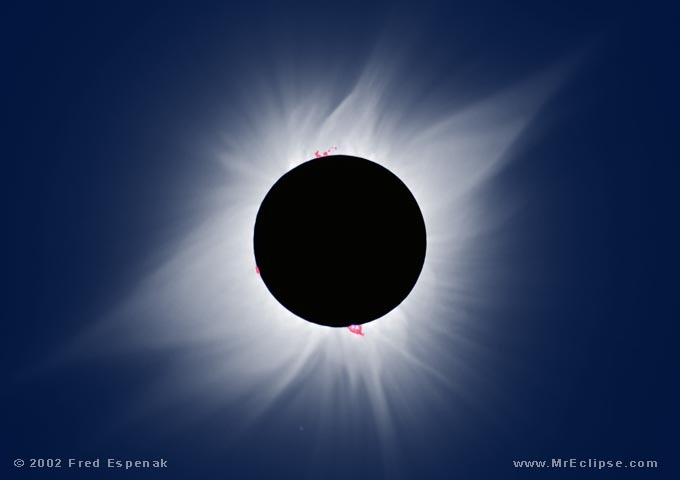 Like two rubies, one on either side, they are small but precious, arching a tiny arch within the rarified white light of the corona which extends far, much farther than in any of the slides we have seen. It does not encircle the sun in a halo, but streams from the two sides, extending farthest near the middle, smallest at the poles. My breathing slows. I float in an absolute peace of wonder. I wish with all my heart that time will stop, now; that I can make this beauty last. Six minutes and fifty-three seconds -- the maximum eclipse time. Here above me, at least in this moment, I see what angels see; not forever; maybe never again, but now; here, now. I am hopelessy addicted, like an addict to his drug, and there is nothing in the world I can do to make it stay. Brian's binoculars pass between us. Through them, the prominences are clearly visible, even the space within their arches. He hands me the long-lense camera. Looking through it, the eclipsed sun appears much larger, but through these looking devices, the image jiggles. I pass them on and look up at the naked beauty above. I snap three photos with my pitiful camera, the eclipsed sun shrunk to insignificance, a mere dot within the aperture. For the rest of the time, I gaze. I barely notice the stars and planets. Thunderheads to the west are already in daylight. The loudspeaker announces: "Prepare to see the diamond ring effect." "I see the diamond ring!" I shout ecstatically. A last, heightened beauty, the last visual gift of totality, the diamond of light breaks brilliantly, lasting a breath of time. Then, it is daylight. No transition. One instant night; the next, day. I am up and running, Brian ahead of me. We grab the railing on the far side of the ship and stare hard out to sea, straining to see the racing shadow disappear. "Did you see it?!" "No. Darn." It is over. I walk across the deck, sit down on the end of my lounge chair, elbows on knees, hands dangling, chin sunk. I gaze, not seeing the artificial green carpet, the scattered white chairs, the shuffling people, feeling the immense, rare knowledge within, the intimate, personal knowledge of totality... already a memory, but a living one. I glance at the sun, grateful to the new moon, up there, too, the two of them together giving this feeling I want to hold onto forever. Body and soul are flooded with the gift of peace. "I will never, never be able to explain this to anyone," I whisper. Am I saddened beyond belief or happier than I have ever been? Wonder washes over me. My sister points her camera. For a moment, I am aware there is a world. I hear the click. She walks away. I become lost, again, in the realm of totality. An hour ago, we waited with tension, excitement, anticipation, looking through protective glasses, marking the progress of the eclipsing sun. The same process is being repeated in reverse, but the people disperse, no one bothering to look up. I look once or twice. Yep, there she is, our sun partially eclipsed by the new moon. There is the crescent shape. After totality, this is nothing. It has lost all its 'umpfh' and everybody knows it. I sit and sit. It is still dim, still cool, but growing brighter. I turn my head. So still for so long, my body creaks when I try to use it. Walking to my cabin, I cherish the feeling the eclipse has given me. It is mine, now. I know I will not be able to keep it any more than I have been able to keep the eclipse. It will last maybe four or six hours... this reality of peace on earth; this end to war. After that, it will fade. I will carry part of it with me for a week, maybe, if I am lucky. Then it will be gone. Sure, I might get it back now and then for a moment, but it will never be like this again; never so strong... unless... I can get to another ...somewhere, somehow. The longest total eclipse for the next 147 years. If I do see another, I must look faster. Though this eclipse lasted over six minutes, I cannot believe it was that long. These were the shortest six minutes of my life. The humans who went insane must have done so in the moments before totality, disoriented by the dimming light, the advancing cold. When it suddenly became night, they covered their eyes in terror, unable to remove their hands until daylight returned. Only then did they dare to look, timidly, upon the world. Those who looked up achieved peace, at least for a moment, for an hour, until the next day, or week, or month, as long as they were able to keep this wonder alive.